This isn't the wallet you need, but the wallet you deserve. This die cast metal batarang folds over and protects your money. Shielded with a black satin colour and a matte finish, this totem provides you with the complete Batman experience. 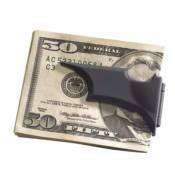 With the strong magnetized grip system, you know your money is safe.